Regency staff during the clean-up campaign. 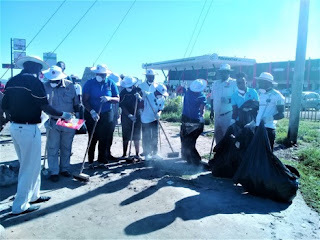 MASVINGO – Regency Group of Hotels that comprise Flamboyant, Chevron and Panyanda lodges went on a clean-up campaign in Masvingo where they picked litter and swept at Exor Service Station. The campaign had 26 members of management involved. “We have targeted Exor because it is the rank for cross border travelers to South Africa and one of the busiest places in Masvingo. This place needs thorough cleaning from time and you must also remember that it being an international station, it is the face of the Ancient City”, said Pious Tshuma who is the general manager for the three hospitality entities. He said that last week’s campaign was organized by Flamboyant and the campaign that they will hold next month will be organized by Chevron. “We thank the President for this very good initiative and as a hotel group we shall be doing this every first Friday of the month,” said Tshuma. Group sales and marketing executive Wendy Ngirazi said the initiative for clean ups was being taken well by the public and she added that some members of the public thanked them for the clean up at Exor. Another campaign was done at Nemamwa Growth Point where more than 200 people participated. These included staff from the Ministry of Youth Sports, Arts and Recreation, Masvingo Rural District Council (RDC) , Great Zimbabwe Hotel, Masvingo City Council and Nemamwa Primary School. Vendors also participated.